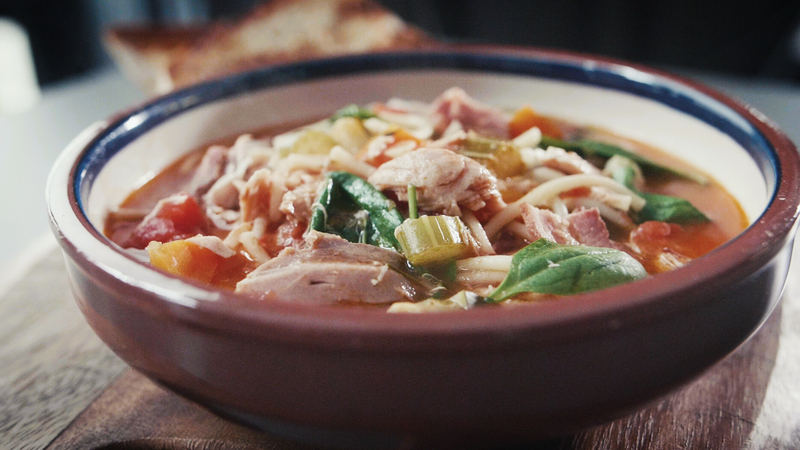 Minestrone is a wonderful one pot wonder that will use all your leftover vegetables and meats. A simple tip for the pasta is the wrap the spaghetti into a clean tea towel and break every 3-4 cm on a side or corner of your work top to obtain small pasta sticks. 1. Heat the oil in a large saucepan over high heat. Add the bacon and fry for 30 seconds until coloured. Add in the garlic, onion, carrot, celery, fennel, courgette and cook, stirring, for 4–5 minutes. 2. Add the thyme, rosemary and chicken stock, tin of tomatoes, salt and pepper and bring to the boil. Simmer for 5 minutes. Add the shredded chicken and broken pasta and cook for 10 minutes. 3. Add the spinach to the soup and remove from the heat. Leave for 3-5 minutes aside until the pasta is plump and the spinach just wilted. 4. Divide the soup between bowls and serve.